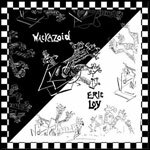 'Wackazoid', Eric Loy's sixth solo album, is yet another example of the experimental guitar-based music that has become more popular recently (Erik Mongrain and James Blackshaw are two more who could be included in the same 'movement'). In this particular offering, Loy maintains a good variety of instruments in his compositions, exploring the diverse sounds of electric and acoustic guitars, as well as the bizarre-looking guitar-harp. 'Russell's Point', a reflective, meandering tune, explores the full range on offer to this extraordinary instrument, and Loy's skill with it is undeniable. Starting with a repeated melody line, Loy brings in waves of plucked chords before introducing some high-speed finger picking. As the melody lines build, so does the intensity. At one point, the chords produced bring to mind the woozy sounds of the sitar. Elsewhere, 'Catharsis', as if intended to be a release of the tension built up by the complicated melody lines of 'Russell's Point', is a more standard slice of electric guitar-based psychedelic noise, which switches between rhythmic interludes, ably supported by the steady drums and bass of Loy's group, the Hipperoos, to mind-bending wig-outs, courtesy of Loy's incredible finger dexterity. It's clear that Loy has tried to keep things interesting, mixing up the moods of the various pieces; straight after the energy of 'Catharsis', Loy introduces 'Drowning Man', a bluesy shuffle whose reasonably simple opening melody line evolves, as with most of Loy's compositions, into a weaving symphony of runs, taps and harmonics. This blues influence reappears in 'Zoo Rendezvous', the album opener and probably the pick of the lot. Loy's many different melodies slide in and out as the intensity increases before winding down with a blues run that closes proceedings. Overall though, while the album lacks nothing in terms of intensity or technical brilliance, many of the tracks wear down the listener long before the final string has been plucked. Like many instrumental albums, the problem is often that there is nothing to break up the continuous guitar sounds, nothing to give the listener's ears a rest. Intense and exhilarating at times, too often songs become indistinguishable from one another, the 'free jazz'-like nature of many tracks working against them. For fans of intricate, technically sumptuous guitar-playing, however, this album is perfect.